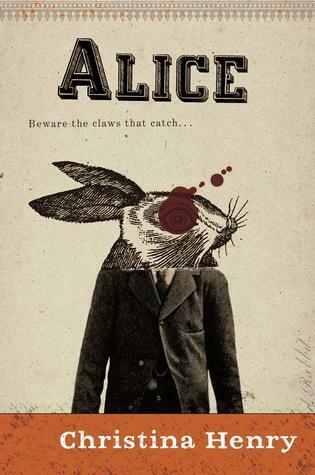 Christina Henry’s Alice is not your average retelling of Lewis Carroll’s Alice in Wonderland. Alice is a patient at an institution in the “old city” of this alternate universe. The old city is full of nothing but mob bosses, felons, and the struggling people. The New City is where the rich live. The people who lived in a peaceful society protected by Ministers. Once a citizen of that part of society, Alice is now trapped. Trapped with a large scar on her cheek and no memory of events that led her to here. As it turns out, the rabbit marked her. Marked her as his own after she took his eye out. But, how did she meet this Rabbit? And, who exactly is he? With returning favorites like the Rabbit, Caterpillar, Jabberwocky, and Walrus, you are also introduced to Hatcher. A killer with a penchant for axes, he is Alice’s “cellmate” next door. Attached to the Jabberwocky, Hatcher is an interesting character. He has no problem killing. In fact, I think he might get off on it. Alice, on the other hand, is thankfully appalled. Their chemistry is undeniable, though. Even from the start as they communicated through a mouse hole. I really loved them together. They were completely different, but worked in such a powerful way. The last page of the book is fantastic. The way the words form on the page is great. Henry has a fresh voice not to be missed or overlooked. This is one of those stories that can stand alone from the Alice in Wonderland world. I think that’s what I liked best about it. This wasn’t your average retelling. It didn’t retell the story with just one or two elements changed. Oh, no. It was completely reimagined. Yes, some of our favorite characters return, but they return in a completely unique way. No longer do they stand for what they once did. This new world was not Wonderland. Nor, was it mentioned really at all. I think I liked that a lot. It was a refreshing read. After reading a previous retelling I wasn’t too fond of, this made me love the world Carroll created even more. I can’t wait for the sequel, Red Queen. I am hooked on Henry’s writing. It is powerful, shocking, and terrifically horrific. Considered fantasy/ Sci-fi for there are magicians and this alternate universe, it reads more like a light horror book with thrills added in. I can’t recommend this enough for fans of Alice in Wonderland. Even fans of horror, fantasy, and Sci-fi. I know I am constantly saying read this. Read that. But, really, read this! You won’t regret it in the least. Borrow it or buy it; this is a book not to be missed. I wish I read it sooner. But, then again now I have a shorter wait to reading the sequel. Hello my lovely readers. Today I am participating in the Virtual Adult Summer Reading Program’s first mini challenge. It’s a great one because it introduces everyone to each other. If you are participating, why not stop by a few bloggers to learn more about them. If you haven’t read my intro post about the program, you can read it here to familiarize yourself with it and maybe even participate. *Who you are and do you have a blog/if so, what is your blog? My name is Hannah. I am currently a blogger at indiereadergirl0329.com I took about a year off, but I am back with a vengeance, trying to blog 5 times a week. Whew. On average it is about 2-3, but I’m getting there. I really missed my blog and connecting with fellow readers, so it is really nice to be getting back in the groove again. *What are the reading goals you are setting for the summer? I would like to read at least 17 books, making it to the Spin Bait level, but I really want to make it to book worm level, reading 25+ books. Can I make my reach goal? That’s reading around 3 books a week. I REALLY want to. I am slightly behind this week, but it has been a busy week. I am going to push harder next week. Hopefully my schedule isn’t as busy. Right now, I am reading This Side of Paradise by F. Scott Fitzgerald for a book club I belong to that meets on Tuesday. I am really bad at reading books for book clubs I am apart of. So, this challenge will definitely help motivate me to read the books, and hopefully before the day of the meeting. *Did you participate in a summer program as a child? What made it memorable for you? I did! I was a voracious reader as a child. I was constantly with a book. Especially during the summer time. I remember when I became obsessed with Roald Dahl for one summer. I read so much by him. Matilda will always be my favorite of his; and, one of my favorite books I read during my childhood. I loved the reading programs; one because I like to win. And, two, it motivates me to read more. And, let’s face it, when I read, I am in my happy, happy place. I need/like to have fellow readers in my circle of friends. With other relationships, too. My current boyfriend is a reader AND writer which makes me super happy. *What is something interesting about yourself? I am a full time crafter. I have a crafting blog, theflourishingcrafter.wordpress.com I even have an etsy store! You can go to it here. I also have a separate website here. I am also a Stampin’ Up! demonstrator. I truly love what I do. Although I do read a lot, and absolutely love it, when I craft I really go somewhere else. It makes me so happy when I finish something I really enjoy. I feel accomplished; and, ready to share it with the world. Why is this interesting about myself? Because I always thought I would be in the publishing industry. Even before I started to blog. It was why I was a literature major. Things change, though. Passions swift. They did for me. I am sure I would have been decently happy at a publishing house, but where I am now, although very hard, I wouldn’t change it for the world. I love making everything I sell. I enjoy sharing it with other people. It’s worthwhile in the long run. And, hey, I get to work for myself. How dream worthy is that?